Giardiniera didn’t do much for me when I was a kiddo. Back then, I only knew it from a giant jar at my uncle’s restaurant. 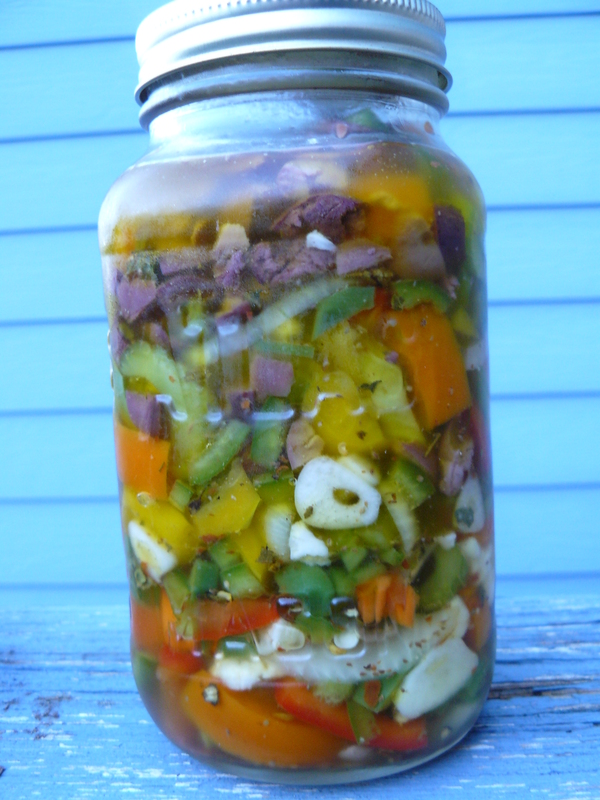 A bunch of marinated vegetables strewn atop an antipasto or chef’s salad–la-la-la…who cares? Then I tried it homemade. What a revelation! So good in and of itself, you might find yourself simply snacking on it by the spoonful, though it’s at its best served over thinly sliced genoa salami or soppressata…either on “the Saturday sandwich” or on a plate. Mmmmm. Talk about love at first bite! I kept asking for more. Perhaps even to the point of obnoxiousness. Did I mention how much I liked that giardiniera? 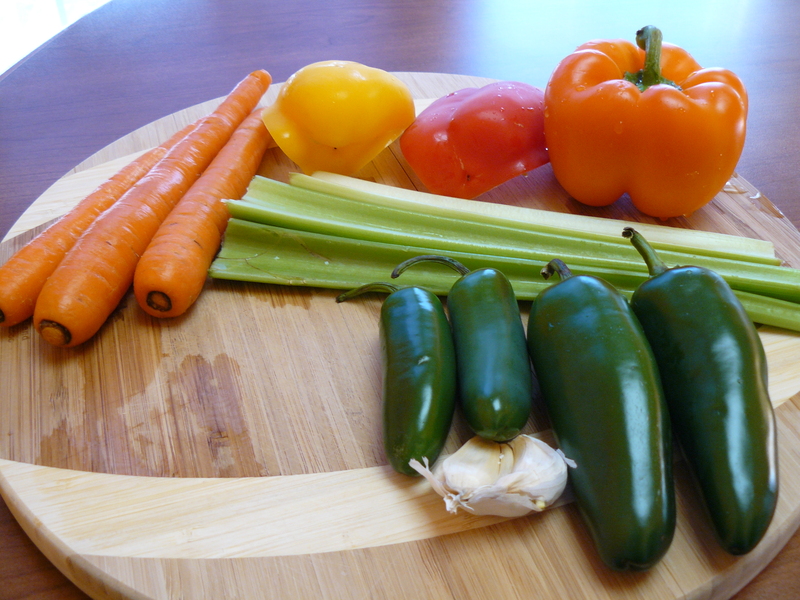 So, could you spare that giardiniera–that was kind of a small portion! Will more be coming, it’s sooooooooooo good? OK, the next batch I will make and share. So, since it’s my turn to chop-chop-chop, I’ll also share the recipe–so easy to make and so worth it. All you need–besides the ingredients and two (2) 1-quart canning jars–is a LARGE bowl and a little patience. 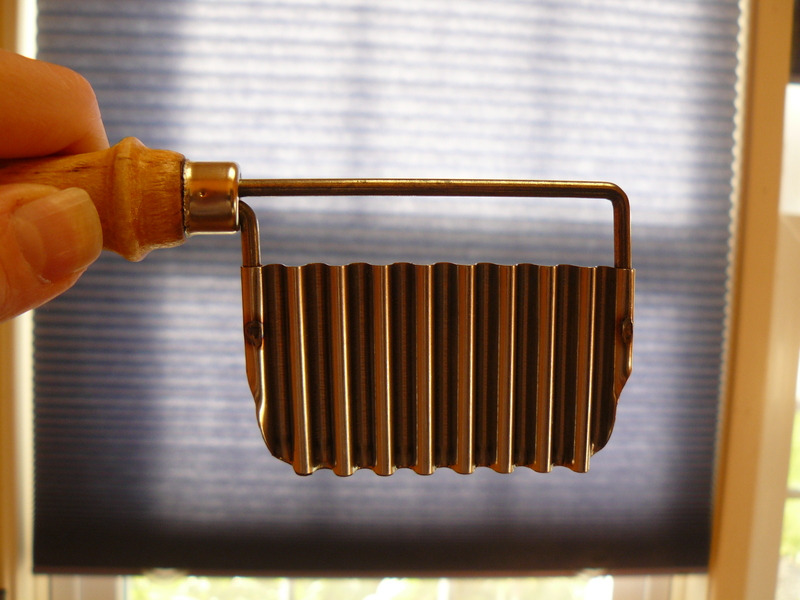 Oh, shh–and a crinkle cutter–how could I forget? Andiamo! Ready to make those carrots extra-delish? That’s right, choose yer weapon carefully–CHOP, CHOP! 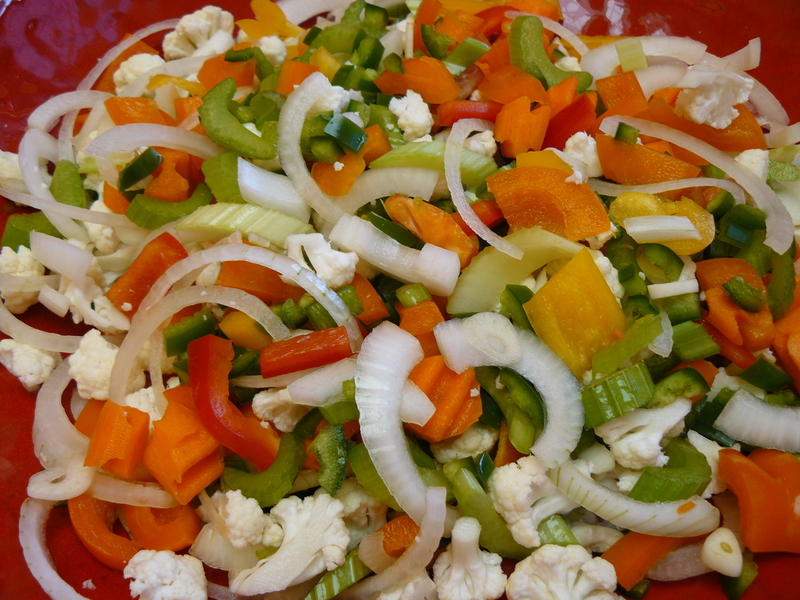 In a large bowl, using your hands, mix the vegetables and salt until well combined. Cover the vegetables with water. Cover the bowl with plastic wrap and allow the mixture to sit, unrefrigerated, for 8 to 12 hours. OOPS, I was not supposed to include garlic with the vegetables. You should save it for the “dressing” part of the program. Oh, well! It didn’t lose in the translation, lucky for me. Pour the vegetables into a colander and rinse thoroughly. Sterilize two 1-quart glass canning jars, with lids. Either run them through the dishwasher or submerge them in boiling water for 10 minutes. In one sterilized jar, combine the herbs and spices; add the vinegar and oil and shake-a-shake-a vigorously to emulsify. Pour half the dressing into the other jar. Pack the vegetables into the jars. I modified the amount of oil and vinegar so you should have plenty to coat the vegetables completely, but if need be, make more dressing and add it. Screw lids onto jars and refrigerate. Here’s the hard part: let the mixture mellow in the fridge for a couple of days before serving. Makes darn close to 2 quarts. 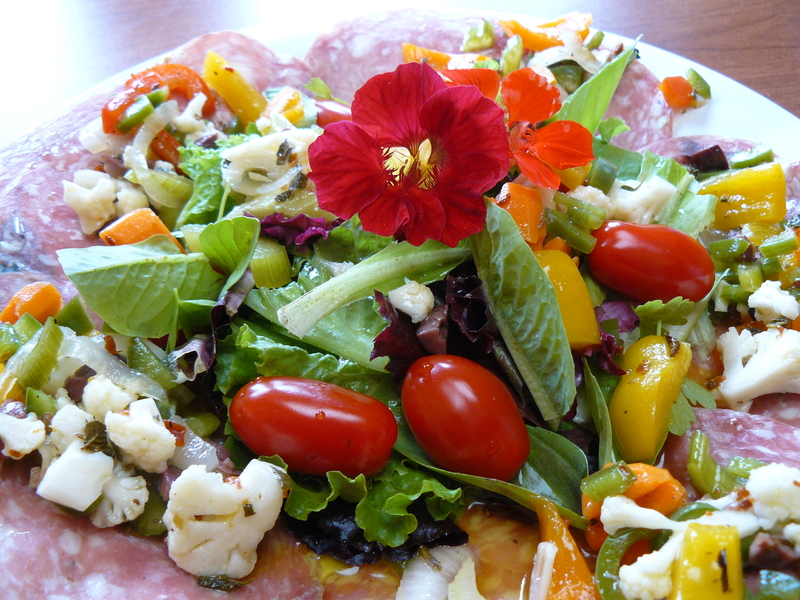 Nothing like a fresh-picked salad for lunch–soppressata circling the plate, homemade giardiniera on top. We’re movin’ on up from Bridge Street, baby!